Cameron Smith was odds on to claim the NRL point-scoring record against the Bulldogs, ironically against the team the man whose record he was about to claim. The Storm skipper fell short of the nine points he needed to surpass Hazem El Masri yet there's a fair chance he'll remember this game for being brought down to size by young Bulldogs rookie winger Jayden Okunbor, proving even the best players can be reduced to being a speed bump up against raw speed and power. Okunbor ran straight at Smith several times during the clash and flattened the Storm skipper on two occasions, leaving Nine's Phil Gould stunned. "He ran straight at Cam Smith and went straight over the top of him again," Gould said. 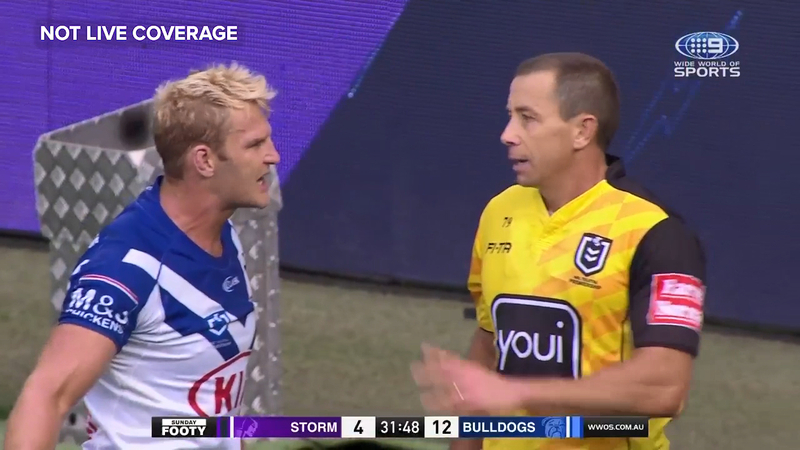 The Canterbury rookie, who ran for 290 metres, was asked after the game about the clashes with Smith but said it was just a privilege to play against the veteran. "i got lucky to get over the top of him a couple of times that's just rugby league you look for the smallest bloke and you run at him". Okunbor's aggression typified Cnaterbury's resolve as they gave The Storm an almighty scare going down 18-16 at AAMI Park. Bulldogs lock Rhyse Martin had the chance to tie the match up in the final minute with a conversion from the sideline, but the kick sailed wide. The Storm needed to rely on some Cameron Munster magic to hit the lead in the 68th minute after trailing all game. Munster broke a 12-12 deadlock when he scored the simplest of tries following a scrum, slipping straight through the visitors' defensive line. But the Bulldogs refused to lay down and winger Reimis Smith crossed in the 77th minute to give sharp-shooter Martin a late chance. Storm coach Craig Bellamy talked up the skilful Bulldogs before the game, despite just their record of just one win for the season. And the visitors lived up to his lofty expectations with a dominant first half that rattled the unbeaten Storm. The Bulldogs arrived in Melbourne without their main playmaker with Kieran Foran out injured and then lost star prop Dylan Napa to an ankle injury early in the game, but out-enthused Melbourne early on. Led by crafty halfback Lachlan Lewis, the Bulldogs were ahead 12-6 at halftime, on track to stretch their recent dominant record in Melbourne to four wins. They started confidently with centre Kerrod Holland opening the scoring in the fourth minute. The Storm's usual solid right edge of Curtis Scott and Suliasi Vunivalu was badly exposed twice - the first by Holland's run between the pair . 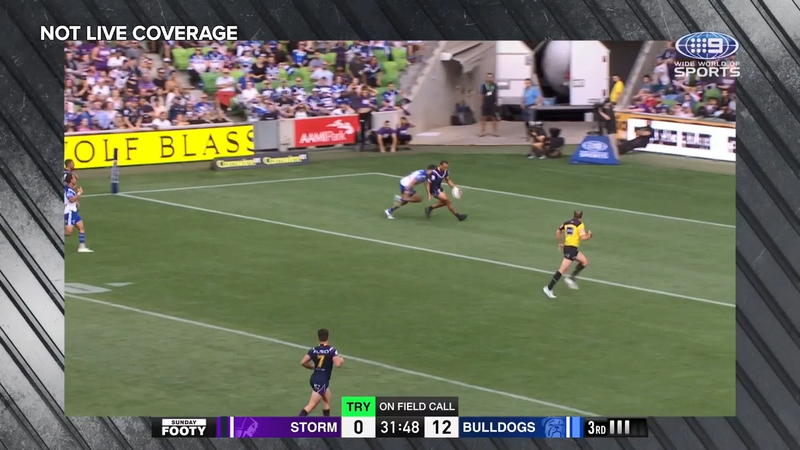 The second try was scored by rangy young winger Jayden Okunbor, when the Storm were again caught short down that side, with the Bulldogs going up 12-0. Melbourne finally got on the scoreboard in the 31st minute when the bunker awarded a penalty try to Will Chambers when Bulldogs winger Smith took out the centre in the race to the ball in the in-goal. Giant Storm forward Tui Kamikamica then levelled at 12-12 with a barn-storming run off a Cameron Smith pass to touch down before the heart-stopping finish. Smith finished the day two points short of levelling Hazem El Masri's all-time scoring record.